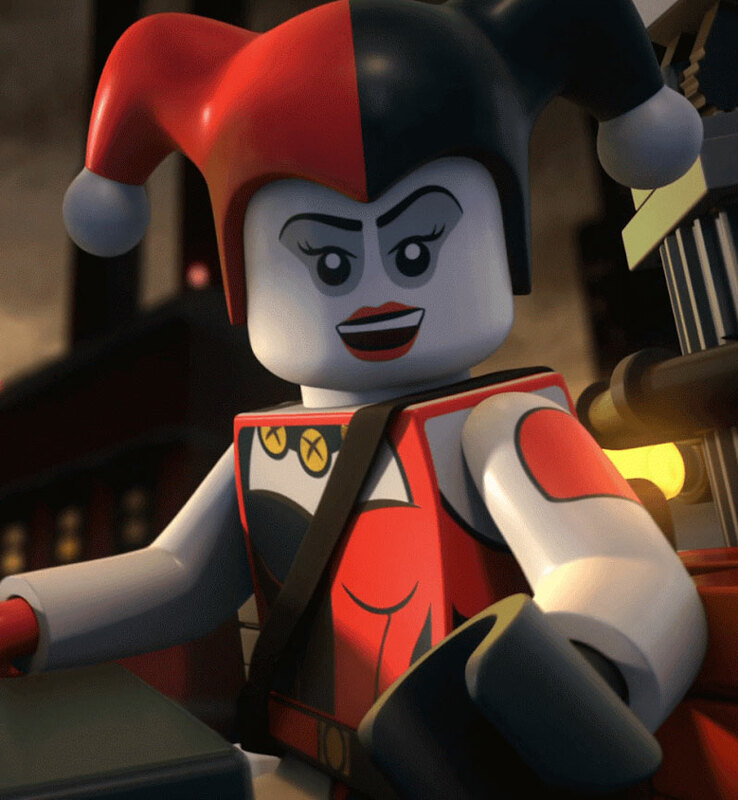 Back in the world of toy-bricks, ‘Harley’ (Tara Strong) had another minor-supporting-villain role in Lego DC Comics Super Heroes: Justice League – Gotham City Breakout (2016), a straight-to-video animated “action comedy” flick, which bore more than a few similarities, plot-wise, to the League’s first block-footed adventure (Lego Batman: The Movie – DC Super Heroes Unite)… especially when it comes to our beloved clown-girl, and her criminal cohorts. Once again, she and a couple other Bat-villains attempt a big heist in the first act, only to get caught and sent to Arkham Asylum, which they then escape thanks to a destructive beam of energy blasting through a wall, leaving them free to rampage across the city once more. Although she gets some good gags in her first couple scenes, and a funny moment with ‘The Joker’ (Jason Spisak) after her arrest, the “Clown Prince of Crime” again chooses to lavish his fickle affection on a new assistant (“Spoony”, a spoon he’s drawn a face on, and makes “talk” via shoddy ventriloquism), leaving Harley effectively side-lined, and only contributing the occasional non-verbal reaction for the rest of the movie (giggling, cheering, etc.). Boo to that! Sigh… Then it was back to Super Hero High, to slog through DC Super Hero Girls: Hero of the Year (2016), another straight-to-video animated feature, without any of the humour, charm, or replay-value of the above. All of my gripes about the DC-SHG web-series and previous spin-off still stand… especially the one about them wasting ‘Big Barda’ (Misty Lee), and Jack Kirby spinning in his grave. I’d also double-down on my sneering at the school’s stupidly lax security measures… besides the continued lack of trouble-spotting cameras on campus, they now have an “intruder alarm” that sounds when an authorised new pupil arrives early to catch up on her reading, but doesn’t sound when a super-villain rocks up to attack a student atop their main building, or when his shadowy minions start breaking into the dorm-rooms to steal powerful weapons from the girls’ night-stands! WTF!? Even after the first attack, ‘Principal Waller’s (Yvette Nicole Brown) idea of “upping security” is to just have more students patrolling the grounds during the day, and then just shrugging and letting everyone go back to sleep again at night (when, as it turns out, the light-fearing baddies are most likely to be active!). GAH!! Of course, I understand that this series is aimed at kids, but again I’d refer you back to the Lego movies as proof that it’s perfectly possible to make cute, colourful, family-friendly entertainment that doesn’t make grown adults want to punch themselves in the brain. It’s also a little depressing that the DC cartoons with male leads seem to be a lot smarter than the ones aimed at a female demographic. 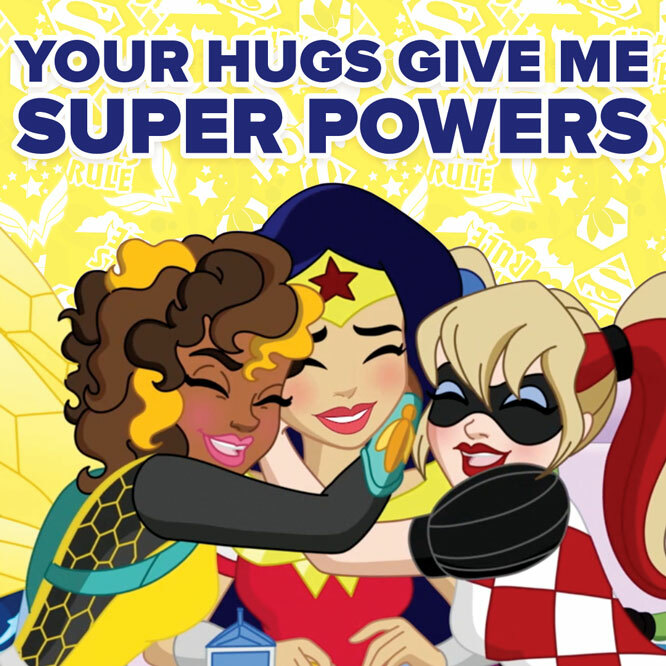 On the upside, they seem to have made Harley and ‘Poison Ivy’ (both voiced by Strong) into besties again… and it is kinda cool that they’ve reimagined our heroine as a pseudo-“super” who can fight alongside heavy-hitters like ‘Wonder Woman’ (Grey Griffin)… but I still find the voice that Strong puts on here incredibly grating, and hate how shy and simpering Ivy is. So, I’m now officially excusing/recusing myself from having to watch any more of this dreck. [Bangs gavel] So be it! Now, if I were going strictly by the credits order listed on her IMDb page, my next entry should be The Lego Batman Movie (2017)… but that’s only just been released at the cinemas here, and won’t be out on DVD until June, so… I’ll have to defer comment until then (though I will say that the character design they’ve gone for looks great, and I am really looking forward to hearing the voice of one of my fave comedy actresses (Jenny Slate) coming out of my fave cartoon crush!). 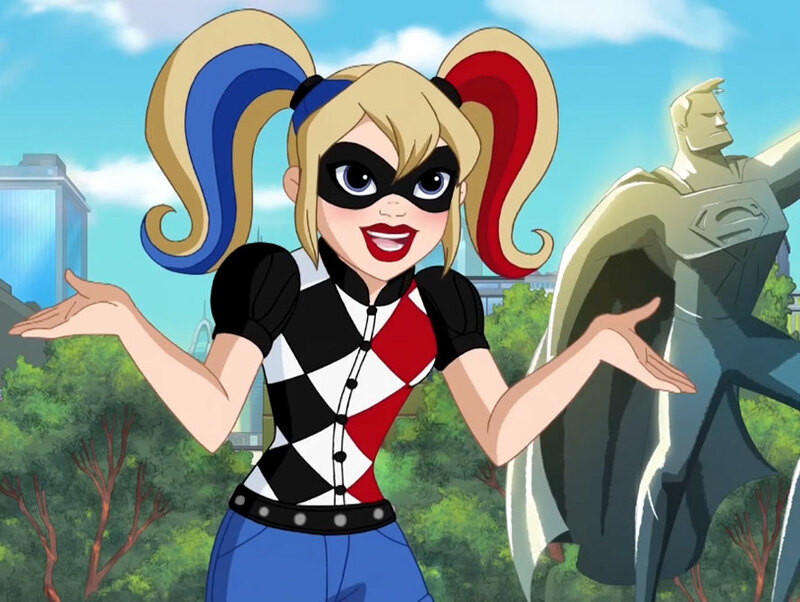 And so, we turn our eyes back to the small-screen, and Harley’s latest TV appearance as a cackling villain in the “cold open” of episode #1.13 (or #1.14, depending on who you believe… either way, it’s called “Speed Demon”) of Justice League Action (2017), a series of animated shorts starring the eponymous superhero team. In this episode, Harley (voiced by Ms. Strong, again, again!) has somehow managed to acquire a magickal Joker-headed sceptre, and is threatening to unleash her inexplicable wrath on the city of Gotham… but she’s quickly/easily neutralised by the snappily-dressed sorceress ‘Zatanna’ (Lacey Chabert), before she and ‘Batman’ (Kevin Conroy) head off to investigate the source of this uncharacteristic power-up. 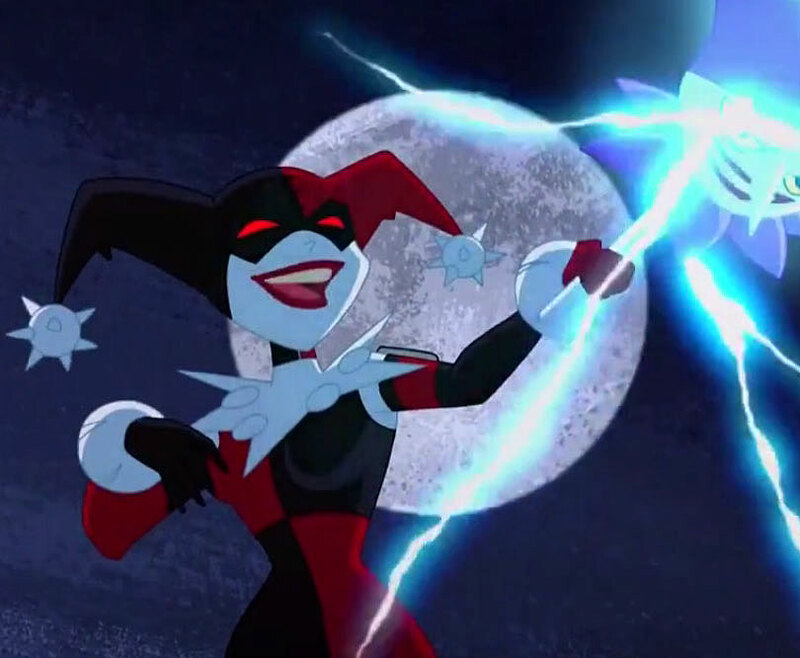 The show itself is only ten minutes long, and Harley’s cameo is literally 30-seconds long, so not much to say about that… though I do kinda dig the spiky little mace-balls on her motley in this version. This entry was posted in Rants about Films, Rants about TV and tagged Amanda Waller, Batgirl, Batman, Big Barda, DC Super Hero Girls, DC Super Hero Girls Hero of the Year, DC Super Heroes Unite, Gotham City Breakout, Grey Griffin, Harley Quinn, Hero of the Year, Jack Kirby, Jason Spisak, Jenny Slate, Justice League, Justice League Action, Kevin Conroy, Lacey Chabert, Lego Batman, Lego DC Comics Super Heroes, Misty Lee, Poison Ivy, Principal Waller, Sarah Hyland, Super Hero High, Tara Strong, The Joker, The Lego Batman Movie, Wonder Woman, Yvette Nicole Brown, Zatanna. Bookmark the permalink.